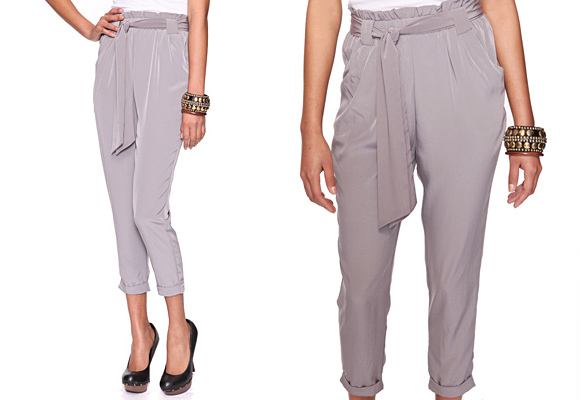 You all may think I am crazy, but I have a serious crush on these pants. The blue version is a bit similar to this wish list item from months and months ago. What do you think? Is this a look you would wear? Leave your thoughts below. oh madeline, i've been looking for a pair of these forever. i mean even if i had a pair i wouldn't be able to wear them for months due to pregnancy. these are super cute.... i've tried so many different pairs on and finding the right fit is just difficult! but one day.... one day i will find THE perfect pair. Ooooo- so cute! And I think they would be great postpartum! I love that you posted these pants. Cause while we were over in Europe everyone was wearing them, I mean everyone and they were in every store. Oh I love these. Love the color, love the material. I will totally be getting these. I have to be honest, I don't like them. I'm just not a fan of this style of pants, I suppose. I actually have a pair of pants like this, in almost this exact same color. I always have a difficult time figuring out what to wear with them, but they are very cute and comfy. I think these types of pants only work on very thin women. As a larger gal, I stay away from this style. But they look comfy.